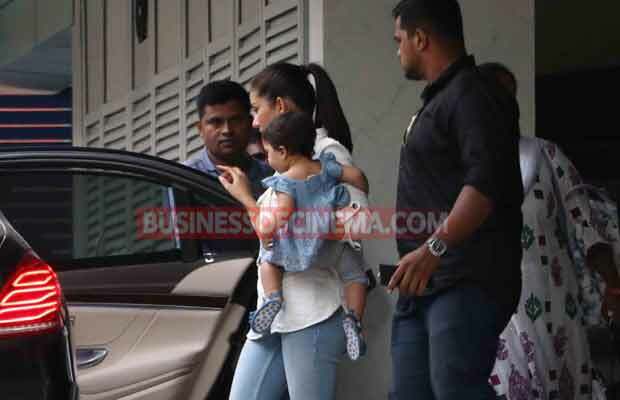 Home BOLLYWOOD Photos: Shahid Kapoor’s Daughter Misha’s Baby Day Out With Mommy Mira Rajput! Photos: Shahid Kapoor’s Daughter Misha’s Baby Day Out With Mommy Mira Rajput! Mira Rajput carries the cute little Misha in her arms as she enjoys her day out! The Bollywood actor Shahid Kapoor’s daughter Misha is probably one of the most famous babies of B-town. No matter where the little munchkin goes, people love to see her clicks. We recently spotted the toddler with her mom Mira Rajput as she was on a day out. While Mira was looking like a very cool mom in that white shirt and faded blue denims, Misha was looking like a bundle of cuteness in that blue frock. Isn’t the kid just adorable? While Shahid Kapoor is mostly busy because of his work, it is Mira who is always there with the kid. We have very often spotted the mother daughter duo having a good time around the city. But Misha is very dear to papa Shahid as well, who keeps sharing her pictures and videos on his official Instagram account. We have seen those cute videos where the star kid is following the dance steps of her father and also the one in which she is clapping with her tiny hands. It was last year on August 26, when Shahid Kapoor and Mira Rajput had welcomed their first kid and since then we have been getting some adorable glimpses of the girl. And we always want more of it! Previous articleWas Jhanvi Kapoor Stalking Ranbir Kapoor? Sridevi Breaks Silence! Next articleBigg Boss 11: Makers Have Decided To Put This Special Clause In Contestants Contract?